I am one of the lucky artists supported by the DecoArt Helping Artist Program. Unfortunately with work overwhelming and taking up most of my free time, I find lengthier craft projects are harder to get to so this art journal page was months in the making! I have had the Crosby, Stills and Nash song “Our House” in my head off and on for months. 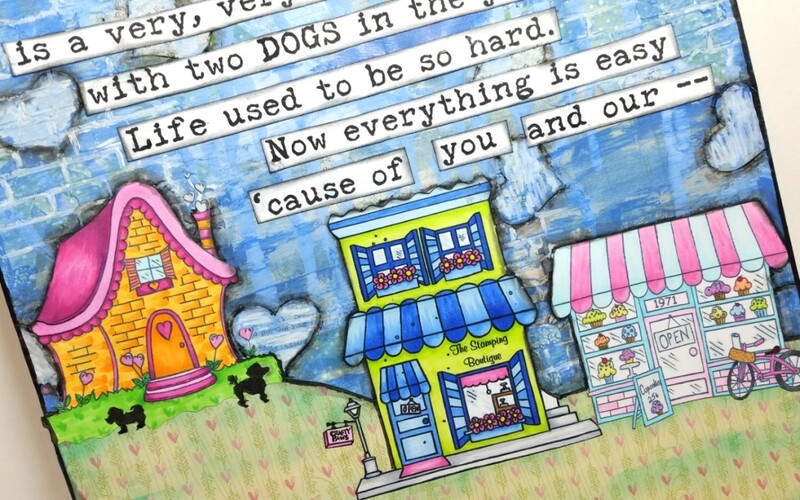 The lyrics to this simple song remind me of my life with Mr. CraftyPaws and our dogs, Biscuit and Bandito. I often find myself absent-mindedly singing it when I take Biscuit and Bandito out into our back yard. I picked out these awesome building digis from The Stamping Boutique back in August and colored them up with a slew of Copic colors in shades that reminded me of 50’s small towns and malt shoppes (sorry I can’t remember the colors; it’s been so long since I colored them up). I created the background base with some old papers from the Dear Lizzy Neopolitan collection, the Amy Tangerine Sketchbook collection, and the Heidi Grace Designs Daydream collection, using Mod Podge and DecoArt Americana Decoupage Matte glue sealer finisher as the adhesives (both worked well, but I found the DecoArt product was thinner and dried faster). 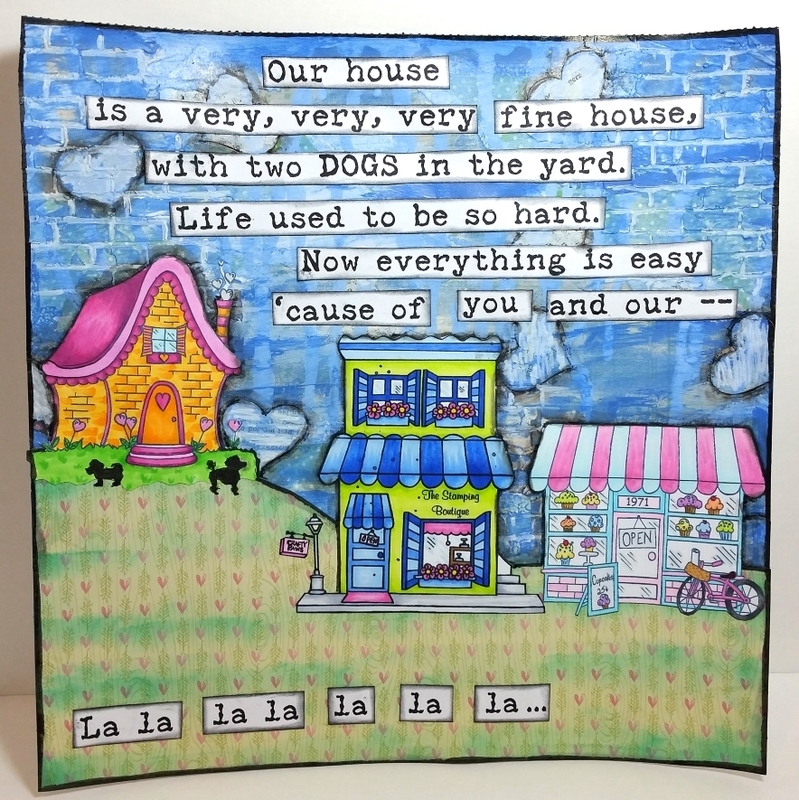 I used the DecoArt Dimensional Effects paintable texture paste with the Tim Holtz Bricked stencil to add texture to the sky background that reflected the brick of the buildings. The texture was really highlighted when I mixed up some DecoArt fluid acrylic paints in cobalt blue and titanium white, brushed it on and then wiped it off with a baby wipe. To help pop out some book paper hearts that I had decoupaged on as well as the building digis that I had worked so hard to color, I used a black Faber-Castell PITT artist pen to outline the images and then softened the outline with a water-dampened Q-tip. I also used a white Faber-Castell PITT artist pen to further highlight the book paper hearts and the relief of the stenciled brick areas. So cute! Love all the colors and little dogs but…. I have a toy poodle, Scarlett. They do make everything lovely don’t they. I can’t think of a better song for you to do your art journal page on! I am singing along as I am reading through your post. Beautiful scene, colors and love how you added so much of the song! So glad you joined us in our Inspired by a Song challenge at Simon Says Stamp Monday challenge! Glad we helped you get your mojo back!! Yes, thanks so much Maura! Wow, this is an amazing journal page! Very pretty and colorful! 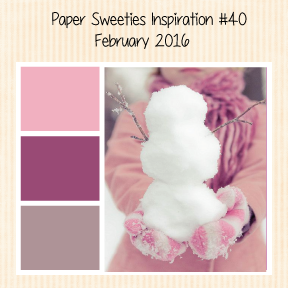 Thanks for playing with us at Paper Sweeties’ February Challenge! What a fun and colorful creations. Amazing! So blessed you joined our previous Challenge and hope you join us again in our current Challenge at Word Art Wednesday. Leaving you with the encouragement only the Word of God can provide in James 1:12 which tells us, “Blessed is the man who remains steadfast under trial, for when he has stood the test he will receive the crown of life, which God has promised to those who love him.” Have a blessed weekend. Thank you so much for the encouraging words, Jo Ann. Lovely scripture too. Thank you.